Mackenzie Country is a high inland basin beneath the Southern Alps and Mt Cook, south-west of Christchurch. Mt Cook (Aoraki) towers above a splendid cast of massive snow-clad peaks that make up Mt Cook/Aoraki National Park. Mt Cook/Aoraki National Park is a harsh land of ice and rock. Glaciers cover 40 percent of it. There are 19 peaks over 3000 metres/9,836 feet including New Zealand's highest mountain, Mt Cook, or Aoraki as it is also known. Nudging one side of Mt Cook is the mighty Tasman Glacier, a 30 km/18 mile giant and one of the longest outside the Himalayas. 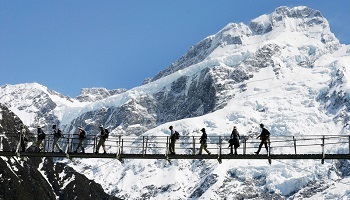 Mt Cook village is an easy five-hour drive from Christchurch. Visitors are encouraged to take the Inland Scenic Route 72 from Christchurch to Fairlie, gateway to Mackenzie Country. 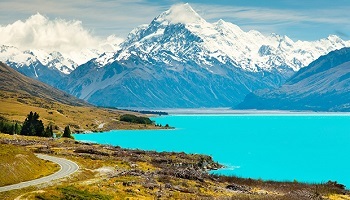 From here the road passes through a land of turquoise lakes, vast open spaces and golden, tussock-covered hills rolling towards the towering Southern Alps. An excellent alternative route or return journey to Christchurch is via Omarama and Waimate (SH82), through more lake and river country and the peaceful Waimate District.